The ringtail is a small cat-like mammal closely related to raccoons. The species is called "ringtails" because they have black rings on their tails. Their dark brown color helps them hide from their predators. Native to California, ringtails are active by night. They are good tree climbers and they use their highly developed senses of hearing and sight to forage. Ringtails use their long tails to maneuver across rock faces and tree trunks effortlessly. They are solitary in nature and mated pairs are rarely seen after breeding season. 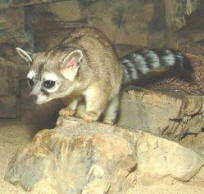 In captivity, two female ringtails are often housed with one male. Both males and females are known to maintain territories. Although their range distribution is widespread, they are mostly found in low densities at most locations. The species are habitat generalists - they are found in a variety of habitats: from dry tropical forests to chaparral habitats and rocky cliffs. Conservation: Their population numbers in the wild, however, has been seriously affected by the pet trade.